Players moving on to greener pastures is a concern for Blizzard, but the studio is quite happy for them to move to another of its games. Blizzard co-founder Frank Pearce says that Blizzard isn't really worried that its new MMO, codenamed "Titan," is going to cause World of Warcraft players to jump ship. It's biggest concern right now, he says, is the effect that Diablo 3 could have on WoW's subscriber figures. 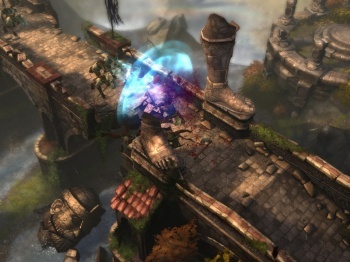 Pearce said that although the gameplay in Diablo 3 wasn't quite the same as in World of Warcraft, it had a similar enough feel that it might lure some WoW players away. Pearce said that Blizzard was ok with that, however, as something was eventually going to cannibalize the WoW audience, and at least this way, they stayed Blizzard customers. He also attacked the idea that WoW had essentially sucked all the air out of the MMO market, and no one could compete with a subscription based game anymore. He said that players ploughed through content in WoW at a phenomenal rate, and he thought that there was scope for people to play another MMO alongside it. He said that if studios built great games, the market would always find room to accommodate them. This isn't the first time that Pearce has said that there was room for WoW and Titan, but it's the first time that Diablo 3 been thrown into the mix. Sources suggest that Diablo 3 won't be out until the end of the year, however, and that Titan won't be ready until the end of 2013, so WoW seemingly has very little to worry about at the moment.